Who knew that luxury cruise lines keep secrets? It turns out those big brochures don’t spell out every trick in their posh books, and first-timers might miss out on special treats, experiences or freebies because they’re not in the know. We scoured Cruise Critic’s Message Boards, compiled notes from our own sailings and then dug even deeper for more inside information on the lesser-known perks of luxury sailings. Use the knowledge to enhance your cruise, and don’t hesitate to spill the beans to other new cruisers. On luxury lines, you can eat whatever you want whenever you want — especially if you give the line a heads up. Just place the request in advance, usually 90 days prior to the sail for complicated requests and 24 to 48 hours for simple ones. Say you want truffle oil-scented popcorn at 4 p.m. each afternoon — even if you’re cruising remote regions like Australia’s Kimberley Coast or Iceland. Or perhaps your fantasy cruise ship dinner is roast duckling with Grand Marnier sauce — every night. Maybe it’s as simple as a craving for pot roast. Special request meals are generally complimentary unless you’re requesting something extravagant. On most luxury ships and some upper-premium lines, you can order off the main dining room dinner menu via room service nightly — and it’s served complimentary. On luxury ships, butlers or stewards will serve your meal in courses, if you like, just like in the restaurant. Although main dining room dinner menus are traditionally written in the appetizer, salad, intermezzo (such as sorbet), entree and dessert sequence, feel free to order untraditionally. Request an entree as a first course, two appetizers as the main event or just make a meal of sweets. No one will bat an eye. You don’t like the thickness of the steak or the tenderness of the pork chop? Do not hesitate to send it back and request another better cut. Servers’ goals are to make you happy. And unlike at some land-based chain restaurants, the onboard chefs are not afraid to present your meat rare or medium-rare if you request it. On formal nights, some luxury lines serve complimentary caviar as a starter, usually with blinis or potatoes. It’s acceptable to ask for a second serving; after that, it’s deemed, well, overboard. Can’t score a reservation for a specialty restaurant? Try asking in person. Maitre d’s are reluctant to say no to any luxury passenger’s request and will do their best to accommodate you. If they can’t, they might bend a rule and let you order from their menu via room service, usually a no-no unless you’re booked in one of the ship’s priciest suites. If you’re counting stars poolside or sipping cocktails at a bar and suddenly crave a burger, know that you can order one — or anything else — from the room service menu. On many luxury lines, anytime you’re outside your suite — and anywhere on the ship — any goodie on the room service menu is yours. Ask any passing crew or pick up a house phone to place your order. Some lines deliver their choice of complimentary canapes to your cabin or suite every afternoon or evening, with daily rotating selections. If you want the same canape every day or want to make requests given your dietary restrictions or preferences, say so and your butler or steward will accommodate. If you rarely eat the canapes and prefer not to have them at all, you can make that request as well. Since food and beverages are complimentary on luxury ships, go ahead, throw a cocktail or dinner party in your cabin or suite for your travel party or newly made friends. It won’t cost a penny if you’re ordering off the complimentary food and beverage menu. (Though you might want to tip your butler extra for helping with setup and bartending. This is tricky as all gratuities are included and this service should be part of that. If you are planning to tip your butler at the end of the cruise — even if gratuities are included — consider upping the amount for the additional service. Although sommeliers present just one complimentary white and one complimentary red wine for dinner, they have a stash of other such wines they’re happy to open for you. If you don’t like what the sommelier is pouring, ask him to open another bottle. While wine is always included on luxury ships, and for many upper-premium lines at lunch and dinner, sometimes you want to splurge on a varietal from the fancy list with price tags. No worries if you can’t finish it at once; your server can mark the bottle and save it for another night — they’ll even whisk it to a different dining venue. 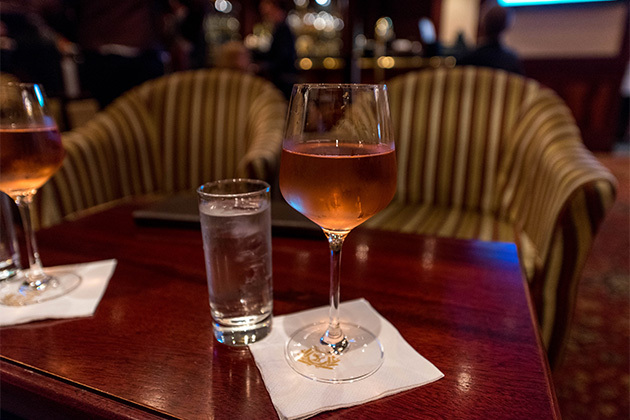 Cocktails are complimentary on luxury cruises, but servers and bartenders often typically reach for the most basic liquors, without giving you a choice of brands. If you have a preference, ask if your favorite vodka, gin, rum or other alcohol is available when you place your order. You might be surprised at the selection of labels included. Mini-bars are usually pre-stocked with the ship’s choice of brands and beverages. Ask your butler or stewardess to replace any you don’t like with those that you do. On upper-premium lines where wines are only complimentary at lunch and dinner, you can score a free glass in many a cooking class between meals. If you don’t like the bathroom toiletries, ask the stewardess or butler if they have a backup brand; luxury ships usually stock hyper-allergenic choices, too. The bigger and more expensive the cabin or suite, the better the perks. Before making a final choice, read the fine print and see if the perks add up to enough value to make booking a higher-level accommodation the real bargain. Let your stewardess or butler know if you’re celebrating a birthday or anniversary (if it isn’t already noted in your cruise documents) on a luxury line such as Silversea or Regent Seven Seas Cruises. They tiptoe in and decorate your suite while you’re away. Hearts, flowers, balloons, a cake — it’s always a lovely surprise. If your cabin is feeling crowded or you can’t squeeze your luggage under the bed or another tucked-away space, ask your stewardess if a piece or two can be stored elsewhere on the ship. 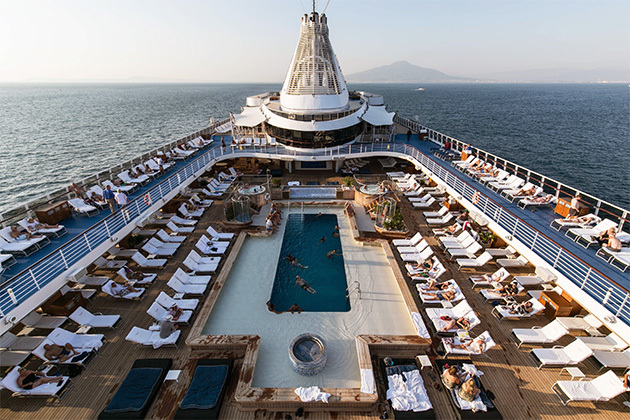 Spa fees are exorbitant on luxury cruises. Most ships offer port-day specials and discounts if you purchase multiple treatments at once. Some even offer sample mini-treatments and discounts on embarkation day. Feel free to engage with enrichment lecturers when they are not working. They know that on luxury ships it’s a passenger perk. You can stop to chat by the pool or in a coffee shop — even invite them to dinner. Just be conscious to share their free time with other passengers. Didn’t have time to download books on your tablet or buy paperbacks before you left on your cruise? Visit the onboard library. Upscale cruise ships stock hundreds of hardcovers to borrow; Seabourn has a whopping 1,000 tomes. With novels, travel guidebooks and biographies — these book nooks are a treasure trove for avid readers. And if you brought a paperback you don’t want to take home, there’s usually a shelf to leave it for the next passenger. Luxury cruise lines offer numerous complimentary enrichment extras every day, like language and dance lessons, and wellness seminars. Read the daily chronicle to see what’s free and note which activities need advance sign-up. Show up at a complimentary exercise class and you might be the only one, or one of a few, who do. Guess what? You score a private or semi-private class with a fitness instructor without paying extra. Complimentary shuttle service in most ports is standard for luxury and most upper-premium cruise lines. If the ship doesn’t dock directly in town, the shuttles will take you to a central location, eliminating the need to haggle with a taxi driver in a foreign language. Here are some less widely known complimentary amenities on specific upper-premium and luxury cruise lines. When you purchase spa services on Azamara, you can access the private spa deck for free. The retreat includes a small seawater thalassotherapy pool and lounge chairs in a more secluded spot than communal areas. Select fitness classes, such as yoga and spinning, are complimentary. Tapas in The Living Room, a newly redone lounge, are complimentary from 4 until 9 p.m. daily. Think hot and cold small plates celebrating Spain’s fabulous flavors. Suite passengers eat for free in specialty restaurants Prime C and Aqualina, as often as they’d like. Passengers can dine once per 15-day or shorter cruise (more if longer) in each of two specialty restaurants for no extra fee; Silk Road and The Sushi Bar — its cuisine designed by superstar chef Nobu Matsuhisa — and Prego, a superb Italian restaurant. After that, it costs $30 per person per dining experience. However, Penthouse passengers can order room service from these two dining venuesevery night for free. For Nobu devotees, the chance to devour as much salmon tartare and Nobu-style lobster with yuzu sauce as you crave each evening without spending a cent extra is nirvana. Dine nightly at The Sushi Bar for no extra cost, but know that this venue doesn’t take reservations. Show up before The Bar opens to secure a seat at the counter or one of the few tables. Tastes, offering a global take on street food dining, is the only specialty restaurant onboard Crystal Cruises that is complimentary no matter how many times you visit. Reservations are recommended. Magic Castle in Hollywood, California, is an exclusive private club where some of the world’s finest magicians perform. Crystal Cruises features Magic Castle At-Sea performances, and when you score tickets onboard, keep them, as they can be used for one-time access to the real Magic Castle back on land. Crystal Cruises goes all-out to celebrate your birthday. The captain or the hotel director sends a letter inviting you to enjoy a special breakfast in your stateroom or in the dining room. Choose from a creative menu including mini-bagels with smoked salmon and wasabi cream cheese, waffle cone with lemon cottage cheese and marinated strawberries, truffle omelet with caviar and mini-doughnuts filled with Cointreau-flavored vanilla custard. If your birthday falls on an early morning shore excursion day, you can switch the feast to another, more convenient, date. And that’s not all. Expect to find birthday congrats posted in the daily newsletter and on television (unless you don’t want the recognition) and to receive a celebratory dessert at dinner. Check the price difference between a Veranda stateroom and a Concierge Level stateroom on Oceania Cruises. It may cost only $200 more for the Concierge Level per passenger, but the upgrades are notable: priority embarkation and luggage delivery, private concierge lounge access, complimentary welcome bottle of Champagne, a choice of Bulgari amenities, complimentary garment pressing on embarkation day, access to the spa deck and free Wi-Fi. All these perks can add up to or exceed the cost of the upgrade — and your cruise will feel far more indulgent. On Oceania Cruises, look for OLife Choice promotional fares; these include airfare, unlimited Wi-Fi and a choice of either shore excursions, beverage package or shipboard credit per stateroom. Since Oceania is not all-inclusive, such promotional fares can make a big difference in total cruise cost. During the Captain’s Welcome Cocktail Party, drinks in several bars are free for about two hours — regardless of whether you’re actually in the lounge where the captain is speaking. Looking for more drink discounts? Pre-dinner and late-night happy hours feature two-for-one drinks. Mad for Oceania-themed swag? You earn Big O points at competitive onboard games like trivia, golf putting and beanbag toss, and redeem them for T-shirts and hats on the last day of the cruise. Although the different prizes have stated point costs, we found the entertainment staffers distributing the goodies were very generous in rounding up your point total to get you the gift you’d like. If you have access to the forward-facing spa terrace (Concierge-level passengers and above), know that it’s the best spot onboard for stargazing because the ship’s lights and funnel smoke don’t get in your way. Jump in the hot tub and look up, and you’re sure to be starstruck with your evening activity. If you love enrichment lectures, seek cruises marked The Smithsonian Collection by Smithsonian Journeys. Regent collaborates with the Smithsonian Institution to secure superb speakers with serious cred; many have doctorates, are professor emeriti and best-selling authors, and some are experts in specialized fields such as Tongan dance or astronomical wormholes. These lecturers are not booked on every cruise, so do your homework. Passengers in Penthouse suites and above needn’t choose between Regent’s three posh brands of bath amenities. Rather, they’re given L’Occitane Mer & Mistral, Bottega Veneta and Guerlain toiletries automatically. Of course, you can ask your butler to remove any you don’t like — but who would? Want to throw a chic cocktail party in your suite for up to eight newfound friends at no cost with plenty of ease? If you’re traveling in a Grand, Master or Regent Suite on Seven Seas Explorer, or Grand or Master on the other Regent ships, the food-and-beverage director or executive chef will personally meet with you to discuss the menu and party arrangements. On Seabourn, caviar isn’t mentioned on the menu yet it’s complimentary to all passengers — anywhere, anytime. Yes, you can order the ravishing roe to nibble by the Jacuzzi, in the privacy of your suite or even in a lounge while sipping cocktails and listening to a singer croon. It’s presented with all the proper trimmings, such as chopped hard-cooked egg whites and minced onions. Naturally, such a delicacy should be savored with a glass of Champagne — complimentary, of course. Seabourn Square doesn’t list or showcase any juices, but if you want to sip yours there, a server will get it for you. Be aware that trivia is cumulative, so try to get on a team right away. If you attempt to do so later in the cruise, it could be awkward. If you want to go shopping with the chef in port, ask the cruise director. While not usually offered as an excursion on non-food and wine sailings, the cruise director will do his best to make it happen — especially if you ask early in the sail. One big SeaDream lure is the opportunity to sleep overnight under the stars on a Balinese daybed. To get first choice for your preferred evening, book it the day you board. You’ll also want to request the bigger bed at the front of the ship, which will be roped off when passengers are sleeping there. The other eight beds are all in a row, four on each side, and adjacent to the Top of the Yacht Bar. There’s little privacy and lots of noise if a rowdy crowd is doing some late-night drinking. Remember to give SeaDream your pajama size when they request it in advance. Matching tops and bottoms are delivered to your stateroom on the first day with your name embroidered on the shirt. They’re not only great to wear for an overnight outdoors on a Balinese daybed, but also to take home for future use. It’s well-known that SeaDream offers complimentary caviar once per cruise during a Champagne-and-caviar party in the surf. However, what’s not advertised is that a complimentary tin of caviar beckons on the poolside cocktail table two nights of each cruise; at the captain’s welcome and farewell cocktail parties. You might find caviar canapes or appetizers on other evenings, but not a whole tin. SeaDream regulars must not be big beer drinkers because the ship keeps only Heineken on tap. If you are a beer lover or have a preferred brand or style of ale, let the line know in advance or the head bartender on the first day of your sailing. Crew will go out of their way to get your favorite brew onboard. Silversea has a Gourmet Bites room service menu in its bigger suites that offers extravagant delicacies such as foie gras with brioche, and caviar and housemade blinis. If you want to throw a cocktail party in your big suite, order an abundance of extravagant nibbles from the Gourmet Bites menu. It’s all complimentary and your butler tidies up while you go off to dinner. All bathrooms onboard Silversea possess room diffusers by haute Italian perfumer Laura Tonatto. If you don’t like the scent, ask for another; the ships only present one type to passengers, but actually stash three different scents onboard. 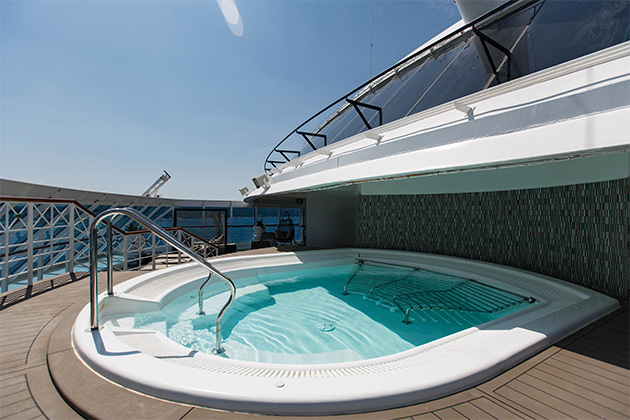 Few cruisers know that the best value suite to book on Silver Shadow and Silver Whisper is a Terrace Suite. It provides access to a veranda without paying a Veranda Suite price. Granted, it’s shared by all nine Terrace Suites and has no furnishings, but feel free to take a chair from your suite, sit outside in semi-privacy and count the money you’ve saved. Complimentary access to the thermal suite lets you partake in all the hot and cold areas, from the fabled snow room and hot tub to salt water thalassotherapy pool and cold bucket dump. The spa provides Nordic bathing ritual instructions — what order to move between rooms and hot and cold water treatments — to ensure you get maximum benefit from the experience. Viking Ocean Cruises has more than just complimentary yoga classes; the line also provides free Zumba, TRX and body conditioning classes. Check when cabaret shows are presented in Torshavn, the late-night dance and nightclub venue. These performances are often the best entertainment onboard. But you must get tickets for your preferred show date in advance, so heads-up. Don’t forget the delicious pea soup at Mamsen’s, served until midnight, with other good and complimentary noshes. This soup is rapidly becoming a signature of Viking Ocean. Windstar Cruises features a complimentary yoga class at least once per cruise. It’s held in a great spot — either onboard outdoors on the fly bridge, or in port, often on a private island when in tropical destinations. Check the daily activity schedule for details. On Windstar Cruises, you can wander up to the bridge anytime the ship is at sea. You can chat with the crew, peek at the equipment — even if it’s 2 a.m. Good to know when jet lag strikes.